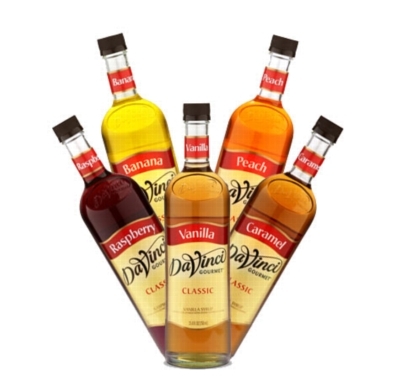 DaVinci Classic Flavored Syrups are perfect for virtually any application: espresso-based drinks, brewed coffee and tea, granitas, smoothies, Italian sodas, desserts, and more. Assort a case of twelve 750 ml. glass bottles with a choice of over 25 delicious flavors. NOTE: The following tart fruit flavors can be used in dairy-based drinks without causing curdling: Cherry, Orange, Raspberry, and Strawberry. DaVinci Gourmet is in the process of converting all glass bottle syrups to plastic bottles. Limited quantities of the flavors below are still available. If you don't see what you're looking for here, you can find the plastic bottles HERE. INGREDIENTS: Pure Cane Sugar, Water, Natural and Artificial Flavor, Sodium Benzoate and Potassium Sorbate (preservatives), Citric Acid. INGREDIENTS: Pure Cane Sugar, Water, Apple Essence, Citric Acid, Sodium Benzoate and Potassium Sorbate (preservatives), Caramel Color. INGREDIENTS: Pure Cane Sugar, Water, Natural and Artificial Flavors, Sodium Benzoate and Potassium Sorbate (preservatives), Citric Acid, Caramel Color. INGREDIENTS: Pure Cane Sugar, Water, Natural Flavor, Citric Acid, Sodium Benzoate and Potassium Sorbate (preservatives), Yellow #5. INGREDIENTS: Pure Cane Sugar, Water, Sodium Benzoate and Potassium Sorbate (preservatives), Citric Acid. INGREDIENTS: Pure Cane Sugar, Water, Natural and Artificial Flavors, Natural Pecan Flavor, Salt, Caramel Color, Sodium Benzoate and Potassium Sorbate (preservatives), Citric Acid. INGREDIENTS: Pure Cane Sugar, Water, Natural and Artificial Flavors, Citric Acid, Sodium Benzoate and Potassium Sorbate (preservatives), Red #40. INGREDIENTS: Pure Cane Sugar, Water, Natural and Artificial Flavors, Caramel Color, Sodium Benzoate and Potassium Sorbate (preservatives), Citric Acid. INGREDIENTS: Pure Cane Sugar, Water, Spice Extract, Sodium Benzoate and Potassium Sorbate (preservatives), Citric Acid. INGREDIENTS: Pure Cane Sugar, Water, Natural and Artificial Flavors, Sodium Benzoate and Potassium Sorbate (preservatives), Citric Acid. INGREDIENTS: Pure Cane Sugar, Water, Natural and Artificial Flavors, Citric Acid, Sodium Benzoate and Potassium Sorbate (preservatives), Caramel Color. INGREDIENTS: Water, Pure Cane Sugar, Natural and Artificial Flavors, Sodium Benzoate and Potassium Sorbate (preservatives), Caramel Color, Citric Acid. INGREDIENTS: Pure Cane Sugar, Water, Natural and Artificial Flavor, Sodium Benzoate and Potassium Sorbate (preservatives), Citric Acid, Caramel Color. INGREDIENTS: Pure Cane Sugar, Water, Natural Flavor, Sodium Benzoate and Potassium Sorbate (preservatives), Citric Acid, Caramel Color. INGREDIENTS: Pure Cane Sugar, Water, Natural and Artificial Flavor, Sodium Benzoate and Potassium Sorbate (preservatives), Caramel Color, Citric Acid. INGREDIENTS: Pure Cane Sugar, Water, Natural and Artificial Flavors, Citric Acid, Sodium Benzoate and Potassium Sorbate (preservatives), Yellow #5. INGREDIENTS: Pure Cane Sugar, Water, Natural and Artificial Flavors, Caramel Color, Phosphoric Acid, Sodium Benzoate and Potassium Sorbate (preservatives).